COLUMBUS, Neb./CHICAGO (Reuters) - Nebraska grain farmer Ryan Ueberrhein was barely breaking even after the U.S.-China trade war pushed prices for his soybean crop to a decade low. Then the nearby Elkhorn River burst its banks as flooding swept across the U.S. farm belt. Uberrhein's farm was left covered in debris after the roiling water receded. He has mounting debts. And he is worried that President Donald Trump may not be able to strike a trade deal with China that would end tariffs on U.S. soybean exports - and allow him to sell whatever grain is left intact at a better price. The trade war "keeps damaging us," said Ueberrhein, 34, of Valley, Nebraska, who voted for Trump. "What the president is doing, we stand by him, but ... we can’t keep getting hit just because a deal can't be made quickly." 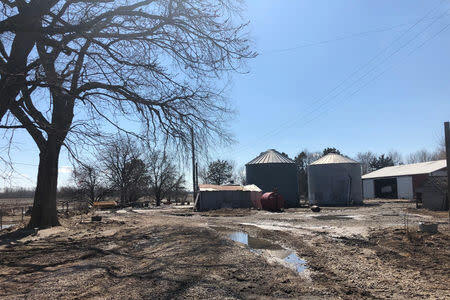 The latest piece of bad news came on March 11, when the Trump administration released its 2020 budget and proposed a 15 percent cut for the U.S. Department of Agriculture, calling its subsidies to farmers "overly generous." "How many times do you have to kick us when we're down?" he said. "If our government and leaders can't step up and start to lead, we're done for," he said. For years, Oswald paid extra for flood insurance. He hoped that government talk of investing in improving U.S. infrastructure would come through - and bolster the levees and dams throughout the Midwest. A few days ago, one of his lenders called. Oswald didn't have to pay the loan right away, the lender said, but he would have to repay it sooner or later. "Help needs to come from Congress, but Congress is so divided, I don't know what's going to happen," Oswald said. "The United States government has always been the insurance of last resort," Grassley said in a phone interview on Friday. "Normal planting would take place around May 1, but I doubt we will make it," said Kendal Sock, a cattle and corn farmer in Genoa. "I wish they’d get this trade deal done, like now."